A term used in debates about urban growth, sprawl does not have a precise, academic definition. As a noun, it most often refers to spread-out development that requires people to use a car for every activity, because it strictly separates housing, shopping, schools, offices, and other land uses from each other. The commercial sprawl landscape features wide roads flanked by parking lots that surround mostly single-story buildings; there are usually many cars but few pedestrians. 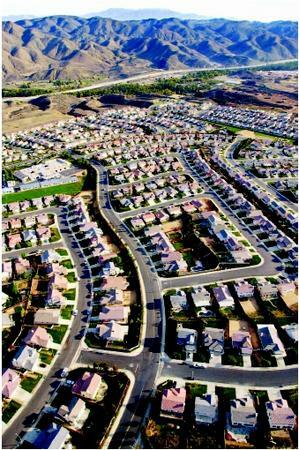 As a verb, sprawl most often refers to metropolitan areas that are consuming land at a faster rate than the population is growing. Sprawl is said to be worst in cities that are spreading out even though their population is stagnant or declining. Some people criticize sprawling growth because it creates traffic congestion, air quality, water pollution, and the revitalization of older neighborhoods harder to address. SEE ALSO S MART G ROWTH . Smart Growth Online. "The Cost of Sprawl: How Much Does It Cost to Drive to Work?" Available from http://www.smartgrowth.org/news/article.asp?art=3071 .